Towards the End of Summer | What am I doing here? It was towards the end of summer. Liezel and I drove towards the Georgian boarder, it was before we were married and she had to leave Armenia and then re-enter with another four month tourist visa. We decided to make the trip a holiday and stay a few nights on the Georgian Black Sea coast near Batumi. On the way to the border we pass through small Armenian roadside towns’ boxy cinderblock and concreate houses with cracked walls and broken roofs and windows and doors with angles from a kids drawing and now beyond care and hope. They are on dirt potholed side roads with drainage making muddy patches even though its dusty summer. And on chimneys and the tops of electrical poles stork nests the size of truck tires made from sticks. 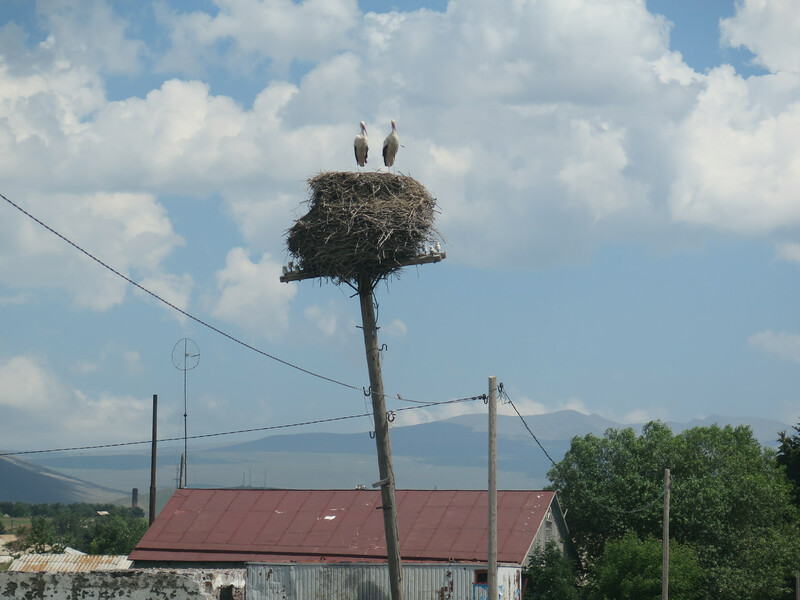 These are the baby delivering white storks, I saw them in the spring standing in their nests often with one or two grown babies of their own, their wings and bodies tipped with black. Now they are just in ones or twos waiting to return to India. In Western Europe these storks fly up from sub-Saharan Africa and some of those arriving in Germany have been found nesting with African arrows still in them. The Germans call these Pfeilstorch or “arrow stork”. I can’t quite put my finger on it but for me there is something very moving about a bird that flies thousands of miles with an arrow in its neck to nest. I think it is something about the choicelessness of doing that thing that must be done. And that maybe too often I think I am too clever to do that thing and find a way to do another more comfortable or distracting thing instead. So we get to the flat land desolate border crossings at Bavra, its hot and dry, exit Armenia enter Georgia, they stamp us through. On the Georgian side we go on to pass through few towns over the next hour, old Russian looking yet chaotic and lonely as a bag lady’s shopping trolley. Then out of Akhalkalaki, winding decent and driving with a valley of Ash and Birch, Oak and Dogwood random and perfect along the banks and river flats of the fast flowing rock jumping stream. And around a corner on the other side of the stream, a mediaeval stone castle on a high cliff. And I feel like a stranger and part of it all the same; somehow big for being there and small as a grain of sand when I think of the lives and lives that a thousand years ago lived in the castle or grew grapes on the long abandoned terraces on the hills opposite and of this dust of their important lives. 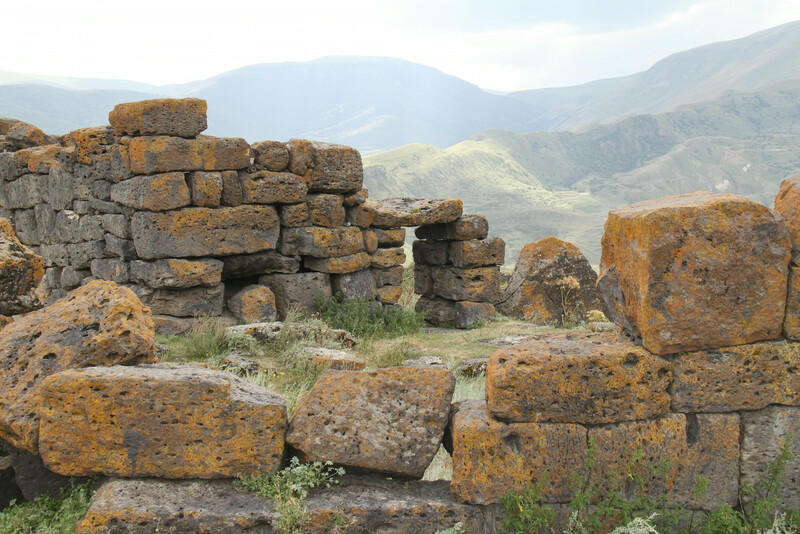 And the 50,000 people who lived in the now abandoned cave city of Vardzia just off to the west, gone. We take a detour about four kilometers up the steep valley wall to the little village of Saros. And high on an overlooking cliff we find the 7th Century monastery of The Archangel. In the churchyard are a couple of young nuns with cheeks the color of robin breasts , long black hair and flowing black habits wielding big grim reaper scythes through long yellow dry grass. Leaning back they carry stacked armfuls of straw to stone stables behind. I want to take their photograph but they motion me no. We go the edge of a cliff amongst stacked stone fortress walls some stone blocks three meters long, built by giants maybe a thousand years before Christ. Looking out, as high as eagles into the deep hazy valley below, I feel I am passing through life faster and faster, racing headlong towards death. Beyond boxes of books, thrift shop clothing ad bric-a-brac, what I will leave and for whom. And even now after all these years I think I should know what my legacy should be and I don’t. Maybe it was the scythes that got me thinking. They open the church for us and we can smell the damp of a thousand years and a thousand years of footfalls on the step and a thousand years of fingertips stroking the monk carved crosses in the stone walls and we light candles and gaze at ancient icons of the Archangel Michael in the half light. That night we stay in the fortress town of Akhaltsikhe and next day head off to the Black Sea across the mountains though the Goderdzi Pass in Ajaria on an unmade creek bed road. We forded small rivers from roadside mountain waterfalls, hung on to the sides of forested mountains far above a rushing mountain river. We stop, all around mountains, a carpet of thick dull green conifers and there in the middle, maybe a kilometer away in the valley a red leafed tree, crazy beautiful for its difference. Our location is just near the border of Turkey and was settled by Greeks 2500 years ago. The red tree bothers me, if this was a person in the developed world, we would put them in a mental institution. We reach Kivariati on the black sea coast in the afternoon, grey sky, grey misty sea, raining and humid. Next morning is sunny and clear. The ocean is sky blue and throwing up a small surf. The beach is a billion rocks most are oval and smooth the size that fits in your palm and you want to take it because it feels precious and unique but so is the next and the next and they are green and gray blue, deep red, white and black and with contrasting veins and soon I have a bag full. We hire umbrellas and plastic beds for the day and watch the beach life. A Russian woman lying like a sow in the waves is too heavy and unstable to get up by herself and laughing joyously and is helped up by her family. A tough looking man with short cropped black hair has some kind of military tattoo between his shoulder blades that looks like a set of gun sites on a sniper stand. He stands with his back to me, feet planted, legs apart, hands on his hips, like he is daring the sea to take him on, He turns around and there is a thick 12 inch scare across his stomach. Hawkers are selling bright colored inflatable water wings and slip on plastic shoes to make walking on the rocks more comfortable. Midafternoon and its hot. I go down to the water’s edge and sit right down with those millions of colored stones at Kiviriati where Russians and Ottomans, Turks and Greeks, Armenians and Georgians have landed, fought, died or started new lives for thousands of years. I sit down and this playful joyful sea tugs at me, and pushes me, friendly and unpredictable as a puppy and I am thinking there is nothing more than this, nowhere to go or not to go, no past or lack of past and no legacy or its lack. I feel between myself and think there is nothing more than this moment forever and nothing to do or that needs doing. Just the presence of the thing and me in it, and for once knowing that I am there. This entry was posted in Postcards and tagged Armenia, Georgia, Working Overseas. Bookmark the permalink.